When Led Zeppelin released Houses Of The Holy on 28th March 1973, they were one of the biggest bands in the world. Houses Of The Holy was their fifth album. Their four previous albums had sold over forty million copies. This made Led Zeppelin one of the biggest selling rock bands in the world. However, their reputation preceded them. Around the world, Led Zeppelin were referred to as one the “unholy trinity of rock.” Their appetite for the rock ’n’ roll lifestyle was legendary. Excess was encouraged within the Led Zeppelin camp. They wore their infamy with pride. Drink, drugs and debauchery was commonplace. So was destruction. The four members of Led Zeppelin weren’t averse to wrecking hotel rooms. Having trashed a room in the Tokyo Hilton, Led Zeppelin were banned from the chain for life. Hotel rooms weren’t just trashed. Television sets out of hotel windows. Another time, John Bonham rode a motorcycle the Continental Hyatt House, which Led Zeppelin nicknamed Riot House. However, when it came time to recording an album, Led Zeppelin put their game head on. That was apparent when recording of Houses Of The Holy began. Houses Of The Holy was Led Zeppelin’s fifth album. It was also an album that saw Led Zeppelin change direction. Gone was the bluesy sound of earlier albums. Replacing it, were songs that featured synths and orchestral arrangements. Funk, reggae, jazz and even doo wop influenced Houses Of The Holy. That wasn’t the end of the changes. Producer, Jimmy Page decided to use layering extensively on Houses Of The Holy. This gave the album a much more multi textured sound. 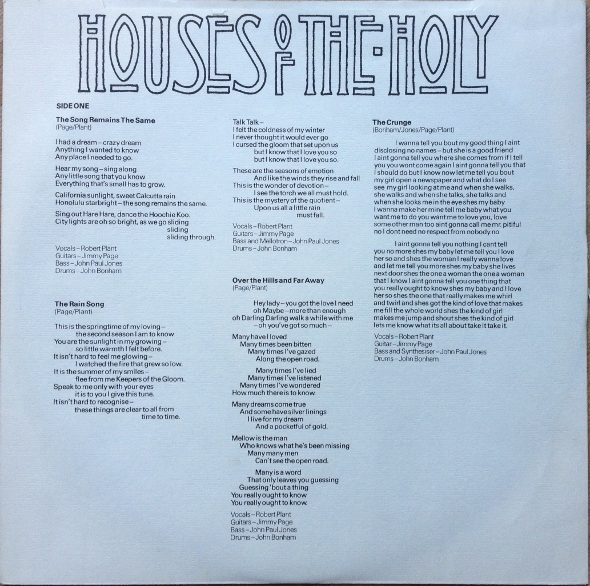 These changes in sound were apparent on the eight songs which feature on Houses Of The Holy, which was recently reissued as a remastered double album by Atlantic Records. On Houses Of The Holy, the Jimmy Page and Robert Plant songwriting partnership cowrote four tracks, The Song Remains The Same, The Rain Song, Over the Hills and Far Away and Dancing Days. They also penned No Quarter with John Paul Jones. The other three tracks, The Crunge, D’yer Mak’er and The Ocean were written by Led Zeppelin. These eight tracks were recorded between January and August 1972. Recording of Houses Of The Holy began as 1972 dawned. A recording session took place at Headley Grange. That’s where the original recording of No Quarter took place. After that, The Rolling Stones mobile recording studio was hired. Led Zeppelin headed to Mick Jagger’s country estate Stargroves, in Berkshire. That’s where recording sessions took place. By May 1972, Led Zeppelin were based in London. The next round of recording sessions took place at Olympic Studios, London. Then as Led Zeppelin embarked upon a tour of America, further sessions took place Electric Lady Studios, New York. Eventually, Led Zeppelin had more than enough songs for Houses Of The Holy. So productive were the recording sessions, that Led Zeppelin had actually recorded more songs than they needed. This included Black Country Woman, The Rover and Houses of the Holy. Led Zeppelin decided to keep these songs for future albums, even though Houses of the Holy would’ve made the perfect title-track for Led Zeppelin’s fifth album. Houses of the Holy was released on 28th March 1973. 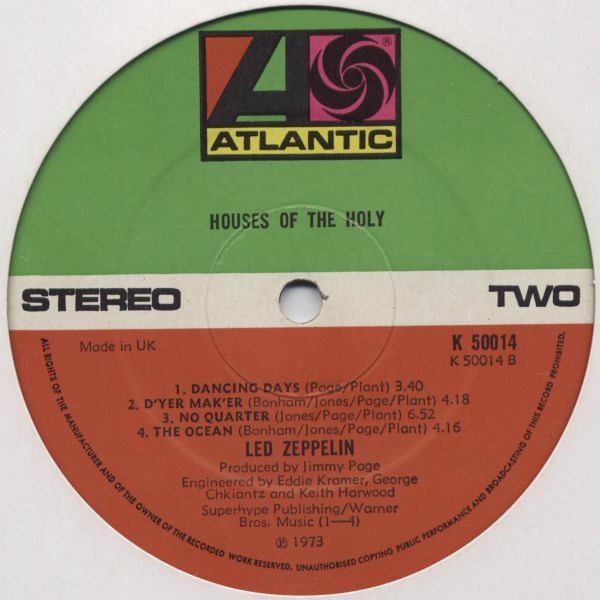 Originally, Houses of the Holy was meant to be released in January 1973. However, the controversy surrounding the album cover, meant that the release date was postponed. The inspiration for Houses of the Holy’s album cover was Arthur C. Clarke’s Childhood’s End. Aubrey Powell of Hipgnosis shot a collage of photos at Giant’s Causeway in Northern Ireland. When the cover was completed, the collage, it featured photos two children shot in black and white, but multi-printed to create the effect of eleven people. Time and effort was taken, in an attempt to get the desired image. However, this didn’t quite work out. Despite Aubrey Powell’s best efforts, it looked like Houses of the Holy’s album cover was going to fall short of what was envisaged. Then a mistake in the postproduction resulted in what many people perceived as a striking album cover. However, not everyone agreed. Many people were uncomfortable with the image on Houses of the Holy’s album cover. They went as far as to describe the image as sinister. Even Atlantic Records weren’t entirely comfortable with the cover. Peter Grant, Led Zeppelin’s manager, allowed Atlantic Records to add a wrap-around paper title band to British and American copies of Houses of the Holy. It obscured the image that Atlantic Records were uncomfortable with. Only when the piece of paper wrapped around the sleeve was broken or slid off, could the listener access the record. Despite doing this, Houses Of The Holy was banned in several Southern States of America. This ban lasted a number of years. However, despite this ban, Houses Of The Holy was a huge success. Before the release of Houses Of The Holy, Led Zeppelin embarked upon a promotional tour. It seemed no expense was spared. Everyone new about Houses Of The Holy and Led Zeppelin’s new sound. Critics who previously, hadn’t been fans of Led Zeppelin, were won over by their new sound. However, as usual, the contrarian Rolling Stone magazine turned its ire on Led Zeppelin. The supposed panacea of music criticism, Rolling Stone, seemed to have a blinkered attitude to Led Zeppelin. From their debut album, Rolling Stone never gave Led Zeppelin a fair chance. By Houses Of The Holy, it was getting to be a standing joke. Members of Led Zeppelin’s entourage awaited Rolling Stone’s tirade against rock ’n’ roll’s biggest group. They weren’t disappointed. Rolling Stone gave Houses Of The Holy a disappointing review. However, Led Zeppelin had the last laugh. On its release, Houses Of The Holy reached number one in America, Britain, Canada and Australia. Houses Of The Holy also reached the top ten in Austria, France, Germany, Italy, Japan, Norway and Spain. Despite the success of Houses Of The Holy, the singles didn’t fare as well. Over The Hills And Far Away was the lead single. It was released in May 1973, reaching number fifty-one in the US Billboard 100 charts. Then in September 1973, D’yer Mak’er reached number twenty in the US Billboard 100 charts. This was disappointing. However, Led Zeppelin were never really a singles band. That became apparent, as gold and platinum discs for Houses Of The Holy came Led Zeppelin’s way. Houses Of The Holy was certified eleven times platinum in America and three times platinum in Britain. In Argentina, Germany and Spain, Houses Of The Holy was certified gold, while in France, Houses Of The Holy was certified gold twice over. Overall, Houses Of The Holy sold nearly twelve million copies. That was pretty good for an album that Rolling Stone panned. Ironically, Rolling Stone include Houses Of The Holy, which I’ll tell you about, in their list of the 500 best albums of all time. Little did Led Zeppelin realise it, but Houses Of The Holy opens with a stonewall classic, The Song Remains The Same. Originally, the song was meant to be an instrumental. That’s apparent as the rhythm section of drummer John Bonham and bassist John Paul Jones lock into the tightest of grooves. They’re then joined by Jimmy Page’s frenzied, multi-tracked guitar playing. His fingers flit furiously up and down the fretboard. He unleashes a guitar masterclass, unleashing a series of scorching, searing licks. They’re multi-tracked, ensuring that a wall of sound assails you. Later, Robert Plant’s vocal enters. It’s been slightly speeded up. However, the focus of your attention is Jimmy’s guitar freewheeling masterclass. It encourages the rest of Led Zeppelin to even greater heights, as they embark upon a new era. The inspiration for The Rain Song was George Harrison. He’d remarked to John Bonham that Led Zeppelin never write ballads. Page and Plant rectify this with a beautiful, wistful, string laden ballad. The arrangement is as far removed from Led Zeppelin as you can get. Their hard rocking rhythm section are restrained. Jimmy Page’s guitar chimes and shimmers. Meanwhile, Robert’s vocal veers between is heartfelt and emotive, to powerful and impassioned. Behind him, swathes of strings provide an orchestral backdrop for what’s an epic ballad from Led Zeppelin. Over the Hills and Far Away is the third consecutive track from the Page and Plant songwriting partnership. They’d matured into one of the best songwriting partnerships in rock, by 1973. Again, the song has an understated introduction. A six string and twelve string acoustic guitar combine before Robert’s lived-in, needy vocal enters. It takes on an urgency. That’s apparent in the arrangement, which soon, unfolds. When it does, Led Zeppelin are at their hard rocking best. A driving, pounding, thunderous rhythm section and screaming, chugging guitars join Robert. He unleashes a vocal powerhouse, as he struts his way through the track. Later, with forty seconds to go, Led Zeppelin throw a curveball. A distant, eerie harpsichord fills the void left by Led Zeppelin at their hard rocking best. On The Crunge, Led Zeppelin pay ‘homage’ to the self-styled Godfather of Funk, James Brown. During three minutes, Led Zeppelin combine funk and rock seamlessly. As drummer John Bonham provides the heartbeat, bassist John Paul Jones and guitarist Jimmy Page unleash some funky licks. Jimmy’s guitar chimes as he frantically plucks out some ringing licks. Meanwhile, stabs of synth provide part of the backdrop to Robert Plant’s vocal. He delivers an over the top, vampish vocal, that just like James Brown, sometimes, veers towards parodic. As Dancing Days unfolds, Led Zeppelin grind their way through the introduction. Before long, Led Zeppelin’s legendary rhythm section cut loose. So does Jimmy’s searing, scorching guitar. Along with the rest of Led Zeppelin, they provide the backdrop for what’s one of Robert’s powerful, swaggering vocals. Again, Led Zeppelin augment their sound with synths. They compliment Led Zeppelin’s traditional, hard rocking sound. However, it’s Robert’s vocal that steals the show. With blistering guitars, synths and the rhythm section for company, Robert Plant delivers his finest vocal on House Of The Holy as he swaggers and struts his way through Dancing Days. Houses Of The Holy didn’t just feature a detour into funk. On D’yer Mak’er, Led Zeppelin turn their hand to reggae. For Led Zeppelin fans weaned on their traditional fusion of blues and rock, this was a shock to their system. However, by 1973, reggae was growing in popularity, and moving towards the mainstream. D’yer Mak’er is a captivating fusion of reggae and rock. The drums are more rock than reggae, while the bass has a reggae feel. As for the guitars, they veer between rock and reggae, as Jimmy showcases his versatility. The same can be said of Robert. His vocal veers between heartfelt and powerful, on this what’s variously a laid-back, rock-tinged slice of reggae. No Quarter sees another change of direction from Led Zeppelin. Subtle synths provide a moody backdrop, as the arrangement meanders along. Then a roll of drums and a searing guitar lick rings out. A buzzing bass then gives way to the moody synths and Robert’s heartbroken vocal. As he delivers the lyrics, they take on an air of mystery. They’ve also mystical quality. That’s no surprise. However, they’re more apparent here, than on earlier album. What really captures your attention is the arrangement. It’s loose and veers between understated to mysterious and dramatic. It flows and meanders along, and is always intense and truly captivating. Quite simply, it’s a seven minute musical tour de force from Led Zeppelin. Closing Houses Of The Holy is The Ocean. It sees Led Zeppelin return to their traditional hard rocking sound. From the moment the band are counted in, they’re at their tightest, ready to explode into action. There’s No Quarter given. The rhythm section drive the arrangement along. John’s mesmeric drums provide the backdrop for Jimmy chugging, screaming licks and Robert’s swaggering vocal. It’s higher than previous tracks, as if it has been pitched up very slightly. Robert unleashes a powerhouse of a vocal. Then later, when his vocal drops out, the track takes a detour via jazz. The bass walks the arrangement along and a crystalline guitar is panned right. Then doo wop harmonies added. Even Robert is impressed. He can’t resist adding: “it’s so good.” He’s so right, as Led Zeppelin close Houses Of The Holy on a genre-melting high. However, The Ocean is only the end of disc one of Atlantic Records’ recently reissued version of Houses Of The Holy. It’s a double album. Disc two features what’s best described as an alternative version of Houses Of The Holy. There’s a variety of versions on this alternative version of Houses Of The Holy. This includes rough mixes of The Crunge, Dancing Days and No Quarter. The alternative mix of The Rain Song is one without the piano. This shows another side to the song. A real find for Led Zeppelin fans will be Guitar Mix Backing Track of Over The Hills And Far Away. Along with two other tracks, it’s among the highlights of this alternative version of Houses Of The Holy. This includes the working mix of The Ocean, which bookends the alternative version of Houses Of The Holy perfectly. Six songs earlier, it opens with the Guitar Overdub Reference Mix of The Song Remains The Same. It’s gets the album of to a blistering start, and is, without doubt, another of the highlights of the alternative version of Houses Of The Holy. For fans of Led Zeppelin, these tracks make Atlantic Records’ recently released remastered version of Houses Of The Holy, a must have, for a variety of reasons. For their fifth album, Houses Of The Holy, Led Zeppelin decided to change direction. Gone was the bluesy influence of their earlier albums. Replacing it, were songs that featured synths and orchestral arrangements. Funk, reggae, jazz and even doo wop influenced Houses Of The Holy. This made Houses Of The Holy a much more eclectic and album. However, that wasn’t the end of the changes. Given production techniques had evolved since Led Zeppelin released their debut album in 1969, it’s not surprising Jimmy Page decided to make use of the new techniques. This included layering. It was used extensively on Houses Of The Holy. Overdubbing was also used extensively on Houses Of The Holy. This was very much the order of the day. That’s apparent throughout Houses Of The Holy, but is apparent on the opening track The Song Remains The Same. Jimmy Page overdubbed a twelve-string guitar, ensuring that a glorious wall of sound assails you. This gave the album a much more multi textured sound. These changes in sound were apparent on the eight songs which feature on Houses Of The Holy, which feature Led Zeppelin evolving as a band. They were gradually moving away from their blues rock roots, becoming a much more eclectic band. 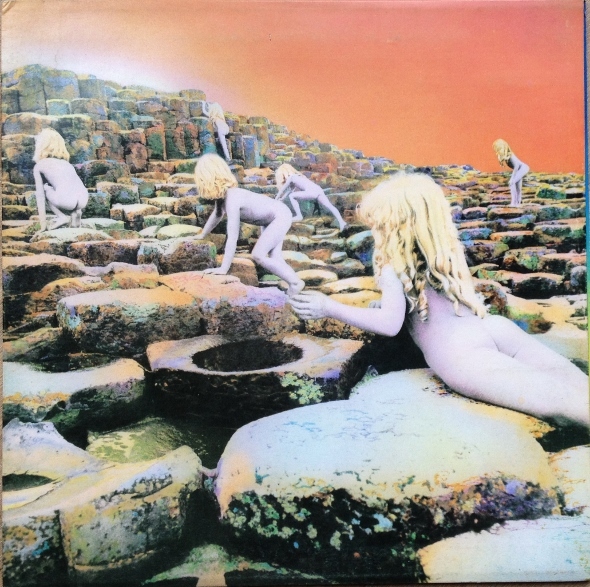 Everything from blues, doo-wop, folk, funk, jazz, reggae and rock can be heard on Houses Of The Holy, which saw Led Zeppelin sell another eleven million albums. Despite this, they couldn’t please some critics. Although Houses Of The Holy saw Led Zeppelin mature and evolved, still some critics weren’t convinced. As usual, Rolling Stone magazine turned its guns on Led Zeppelin. For Led Zeppelin, this had been frustrating. However, by Houses Of The Holy, they realised that regardless of how good an album they released, Rolling Stone would never be won over. In Houses Of The Holy’s case, it was another classic album from Led Zeppelin. It sold over eleven million copies. That’s not surprising. By the time Led Zeppelin released House Of The Holy, they were one of the biggest bands in the world. They’d fans across the globe, who hungrily awaited each release. This was the case with House Of The Holy, which would later, receive classic status. In the intervening forty-one years, critics have reappraised Houses Of The Holy. It’s now perceived as a stonewall classic, where Led Zeppelin become musical shape shifters. They were no longer just a hard rocking group. Their music was much more eclectic and all encompassing. Even the non-believers, like Rolling Stone, the so called panacea of music criticism, changed their about House Of The Holy. They included Led Zeppelin’s Houses Of The Holy in its list of the 500 best albums of all time. Its inclusion is deserving, as Led Zeplelin mature, evolve and come of age on House Of The Holy, which was a career defining album.